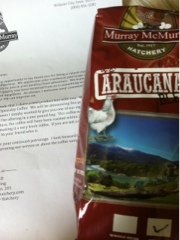 In the mail we received a box, unlike the ones we usually receive from our poultry supplier. The boxes usually have lots of holes in them, and the sound of live poultry or waterfowl are heard. This week, filling our mailbox, was an item that can only be described as market extension. Coffee?! From our poultry supplier? And even more fun, named for the variety of chicken that originates in the part of the world where the bean originates. There will be a total of 8 available, the pound we received is named Araucanas Blend, which means the beans were grown in South America...where those green legged, colorful eggshell laying hens also originate. Roasted just hours before shipped, beans from locations that match all of the old breed varieties we raise for eggs, how fun is that? !